Demand for grass-fed beef has skyrocketed over the last decade. Ancestral health became a thing, and the evolutionary theory that wild is better took hold. Viewed as a healthier, cleaner, and more humane product than grain-fed beef, many advocate it as the only choice. But is grass-fed beef necessary? And is it healthier than grain-fed? This article will take a propaganda-free look at the arguments both for and against grass-fed beef. The way in which farmers produce both varieties of beef can wildly differ. Before looking at the nutritional values and the impact on human health, here is a quick rundown of the major differences. 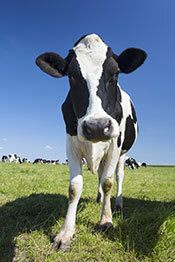 The major difference is that grain-fed cows feed on grains such as corn, cottonseed, sorghum, and soy (1, 2). Grain-based feeds are not a species-appropriate diet, and many question the ethics of feeding cattle food which is likely to make them sick. For instance, studies show that grain-fed cows have digestive issues and are more liable to suffer from bacterial contamination (3, 4). One particular study shows that 11.1% of grain-fed cows suffer from liver abscesses after 120 days in a feedlot. In contrast, the rate of afflicted grass-fed cows was only 0.2% (5). Grass-fed cows spend their days eating grass, which is a far more natural diet for cattle. Key Point: Grass-fed cows eat a more natural diet and enjoy better health. Generally speaking, grass-fed beef is better for the animal because it means they can graze on pasture all day and move around. This environment allows the animal chance to enjoy a more natural life with greater freedom, and eat whatever leafy greens they can find. When it comes to grain-fed cattle, the welfare of the animal vastly differs depending on the operation. However, not all grain-fed cows spend their lives in confined cages in concentrated animal feeding operations (CAFO). This idea is a big misconception which is not true. CAFO operations, sometimes known as feedlots, are a kind of factory farm. Cattle are concentrated, confined, and in some (not all) cases, barely have any room to move. This system somewhat replicates assembly lines in factories, except it is using live animals rather than products. There is no nice way to say this, but CAFO farms focus on turning cattle into beef as quickly as possible to maximize productivity and profitability. Personally, I dislike this type of farming on animal welfare grounds and prefer more humane options. It is worth remembering that not all grain-fed cows live in a harsh CAFO environment. Some farms allow their cattle access to pasture but feed them supplementary grains too. There is also ‘certified organic’ beef, and the requirements for certification include that animals have easy outdoor access (6). Many smaller grain-based farms operate on a similar principle but just cannot afford organic certification. For anyone buying US beef concerned with animal welfare, then you can also look for the ‘certified humane’ label, which guarantees animals live with sufficient space and comfort. Key Point: Pastured cattle generally live a happier and healthier life. Regarding grain-fed operations, some are terrible, but others do care about animal welfare. Is grass-fed more nutrient-dense than grain-fed beef? The short answer is yes, but not by as much as you might expect. And beef from either source is a nutritionally dense, beneficial food that adds a lot of beneficial nutrients to our diet. To demonstrate the differences, we can look to a 2010 meta-analysis which analyzed the nutritional compositions of grass-fed and grain-fed beef. The key point was that grass-fed beef is leaner than grain-fed. The latter can be relatively low in fat or very high, depending on the feeding regime (how much grains the cow ate) and exercise. Saturated fat content is slightly lower in animals raised on pasture, but the difference is minimal. Similar to plants, animal foods also contain certain health-promoting antioxidants. For instance, glutathione, superoxide dismutase, and catalase. These compounds help scavenge free radicals and fight against oxidative stress (8, 9). These compounds occur in high amounts in grass, so grass-fed beef tends to provide a higher concentration of them. Conjugated linoleic acid is a natural trans-fat, but don’t worry—it is healthy and nothing like the artificial trans-fats in shortening. A substantial amount of research shows that CLA may help protect against a myriad of chronic diseases including cancer and heart disease. A meta-analysis of randomized, controlled trials also indicates that higher dietary CLA results in a small but consistent fat loss in humans (6, 11). Grass-fed beef contains a higher concentration of fat-soluble vitamins A and E.
Cows eating grass consume a wide variety of carotenoids, which convert into pro-vitamin A inside the cow’s stomach. A 2005 study showed that beef from pasture-fed cattle tends to have a seven-times higher vitamin A content (12). Vitamin E, a kind of antioxidant otherwise known as tocopherol, is another advantage that grass-fed beef has over its grain-fed counterpart. As shown above, grass-fed beef contains a higher amount of vitamin E.
If you don’t know oleic acid, then let me introduce it to you; it’s the “heart-healthy” fatty acid in olive oil. A lot of people don’t realize this, but it’s also the predominant fatty acid in meat—including beef. Seeing as oleic acid increases with the more marbling beef has, grain-fed beef contains more due to the higher fat content. A range of studies shows that grass-fed beef has approximately 30-70% less MUFA than grain-fed beef does (13). 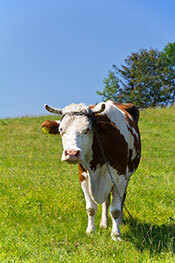 Grass-fed animals have a higher amount of omega-3 and therefore a better omega 6 to 3 ratio. As the table shows, the omega 6 to 3 ratio stands somewhere between 1.44 and 3.72 to 1 for grass-fed beef. In contrast, for grain-fed beef it was in the range 3.57 to 13.6, likely depending on how much grain the cattle ate. Key Point: Grass-fed beef has an overall healthier nutrient profile. However, grain-fed beef is still nutritious in its own right. To give a balanced overview, we’ll now look at five reasons to choose grass-fed beef followed by five counter-arguments for grain-fed. Cattle raised on pasture eat their natural diet and live in their natural environment. As a result, they are both healthier and happier. As a result, they are both healthier and happier. Due to subsisting on a species-appropriate diet, pasture raised cattle are not as prone to infection and illness as their grain-fed counterparts. For one thing, this means that they are much less likely to need antibiotic treatment. Cattle in CAFO operations often need anti-microbial drugs, and there is routine use of antibiotics (14). As previously mentioned, grass-fed beef contains more CLA than grain-fed. Higher intake of CLA appears to reduce cancer risk (15). A large body of evidence suggests that CLA has anti-tumor properties (16). Clinical studies show that CLA intake reduces triglycerides, and the majority of studies suggest a beneficial effect on cardiovascular risk (17). The omega 6 to 3 ratio is optimal for grass-fed beef but can vary depending on the cattle’s diet for grain-fed beef. Traditional human diets were close to a 1:1 ratio, but many people today eat as much as 20:1 (18, 19). Too much dietary omega-6 is pro-inflammatory and increases the risk of weight gain and inflammatory diseases. It is important to remember that beef is not a large supplier of polyunsaturated fats and mainly consists of saturated and monounsaturated fat. However, grass-fed beef unquestionably has a healthier omega ratio and every little helps. By opting for grass-fed beef, you are supporting small farms who raise their cows in a natural, humane way. Key Point: There’s no doubt that grass-fed beef has a better nutrient panel than grain-fed beef. On the other hand, it also costs more money. The benefits of grass-fed beef are undeniable, but is it necessary? Protein, fat, carbohydrate, saturated fat, vitamins and minerals — they are almost the same. They are not identical, and grass-fed beef has a slightly better profile due to the nutritionally superior diet of the cattle. 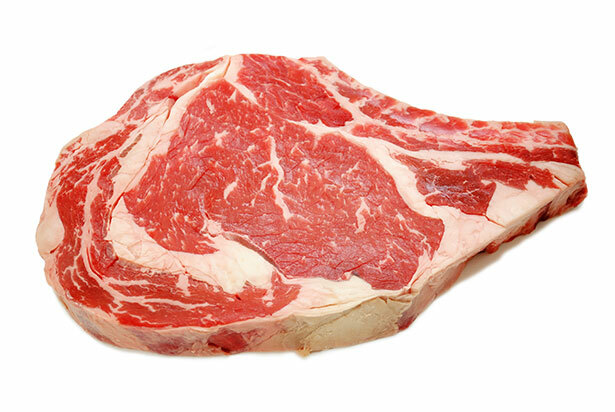 However, grain-fed beef is also nutrient-dense, and it is often less than half the price. The omega 6 to omega 3 is important, but if you are eating oily fish and avoiding vegetable oils, it is unlikely to cause problems. We often read about how grass-fed beef is essential and about the (somewhat exaggerated) “dangers” of grain-fed beef. Yes, grass-fed is optimal, but the price dictates that not everyone is in a position to buy it. 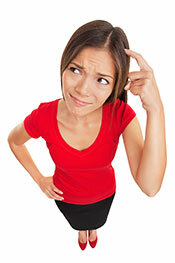 When money is tight, spending double the amount of money for the same amount of meat is a difficult ask. And a diet with grain-fed beef is better than no beef; so if affordability is an issue, don’t worry about going for the grain-fed option. Grass-fed and grain-fed beef have a different taste, and we can attribute this to the varying levels of fat and marbling between the two. Think about bacon, pork belly, salmon, ribeye steak… fat tastes great. We can see extreme levels of fat in world-famous beef such as Japanese Wagyu, and this is a big factor in why it tastes so good. In short, many people believe grain-fed tastes better. As earlier mentioned, not all grain-fed cows live a life of confinement, and some do have access to the outdoors. If you care about animal welfare, then knowing where your beef came from is important. In like manner, not all grass-fed beef is truly pastured, and a lot of it is “grain finished,” making the nutritional profile very similar to grain-fed. There are many reasons to choose grass-fed beef, but the disparities in health benefits are somewhat exaggerated. Both products are healthy, grass-fed beef slightly more so. Key Point: Grain-fed beef isn’t quite as nutritious as grass-fed, but it is still healthy and a lot cheaper. If animal welfare is the biggest concern, then choosing 100% grass-fed beef is the obvious option. Making this choice guarantees the animal is free to run around and eat its natural diet. If health and nutrition are the biggest concern then…grass-fed beef is still better. That said, it isn’t necessary; grain-fed has many health benefits too, and it is much more affordable. To sum up… while grass-fed beef is the superior choice, go for whatever you can afford. Both options are good for you. For more on grass-fed meat, see this guide to bison. So, should there be a concern for the grain being fed as having been a gmo product? I wouldn’t think so. We don’t really have any conclusive science that GMOs cause harm at this time, and I doubt this would have a negative impact on meat. Meat from natural, pasture-raised animals is always ideal, but affordability is important too – whatever someone can comfortably affordable is great. Thanks, Wilhelmina – glad you liked it. Interesting. A similar comparison of wild v farmed Salmon would also be of interest. … and amazingly enough, as I post my comment the relevant article pops up! Haha yes. I just saw your first comment and was about to answer… but you saved me from mentioning that!